Thirty miles from the bustle and skyscrapers of downtown Seattle is a gateway to Washington’s wine industry. Woodinville is a city in the Seattle metropolitan area and has become known for an increasing number of prominent wineries and tasting rooms. I popped over to Woodinville on my recent West Coast tasting trip, and learned how important this little city is to the history and prominence of the Washington wine industry. Geographically and viticulturally Washington is divided into two sections, east and west, separated by the Cascade Mountain range. The mountains create a rain shadow, blocking precipitation and moisture from the Pacific Ocean from reaching the east. The result: wet west, dry east. About 99% of the state’s vineyards are located in the drier, desert-like climate of the eastern half, which includes the Columbia Valley AVA and its many sub-AVAs. On the flip side, the cooler, wetter west is responsible for less than 1% of production. Woodinville resides in the wet west. Many producers grow their grapes in the dry east, and then truck their grapes over the Cascades to Woodinville’s many wineries. A lot of Washington’s grapes get some serious mileage under their belts! Why Woodinville? Even though Woodinville is far from the main growing regions, it has the advantage for winemakers of being closer to airports, distributors offices and other related businesses… and tourists! 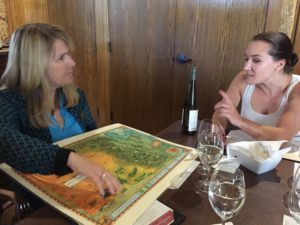 The area’s tasting rooms also capture the nearby Seattle tourism crowd, allowing visitors who wouldn’t make the long drive to Columbia Valley to enjoy this gateway to Washington wines. On the day we visited, a 30 minute drive from Seattle was all it took to taste the breadth of Washington wines. Visits to Chateau Ste. Michelle and Novelty Hill Januik would show us the past, present and future of Woodinville. While many have not heard of Woodinville, everybody has heard of Chateau Ste. Michelle. Its world famous manicured acres lie in the ‘Hollywood District’ of Woodinville. We walked into the French-style chateau and met Melissa Grimaldi, who would share with us the history, operations and wines of Chateau Ste. Michelle. Chateau Ste. Michelle was on my hit list for two reasons. First: Chateau Ste. Michelle is the oldest winery in Washington state. Its history starts just after prohibition, but a major develop would occur in 1967 when legendary winemaker Andre Tchelistcheff introduced a new line of premium vinifera wines called Ste. Michelle Vintners. Four years later, Ste. Michelle Vintners built a French style chateau in Woodinville, and changed its name to Chateau Ste. Michelle. Chateau Ste. Michelle’s history and growth is synonymous with Washington’s history and growth. It dispelled the misconception that great wine can only come from Italy or California. I also wanted to visit because Chateau Ste. Michelle is a proud corporate partner of the Women of the Vine Alliance. The Women of the Vine Alliance is the world’s leading alliance dedicated to the advancement of women in the wine and spirits industry, of which I’m proud to be a member. It’s founder and president Deborah Brenner encouraged me to visit Chateau Ste. Michelle, a producer that had participated so enthusiastically in the promotion of women in the Washington and global wine industry. Melissa Grimaldi is one of those great women of wine, and she popped for us several special bottles. The 2012 Artist Series Red Blend Close Label immediately caught my eye. The Chateau Ste. 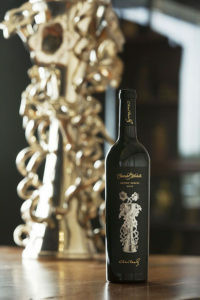 Michelle Artist Series blends great winemaking and world class artists. This 20th Artist Series bottling features the work Dale Chihuly... we had just come from the Chihuly Garden and Glass museum in Seattle. His glass work is some of the most extraordinary art I’ve seen in my life, and it was immediately pleasurable to see his work depicted on the wine label. The wine was awesome, an elegant Meritage of Columbia Valley fruit from the idyllic 2012 vintage. A great sweet surprise was the 2014 Muscat Canelli, which unfortunately is only available online or at the Chateau. Also from Columbia Valley, 30-year-old Muscat Canelli vines make a ‘dessert’ wine, balanced perfectly with crisp acidity and sweetness, with baking spices and orchard fruits. With Chateau Ste. Michelle’s history and prominence, it is a part of so many winemakers’ resumés. We’d leave Chateau Ste. Michelle and head down the street to one such alumnus: Mike Januik. Novelty Hill Januik is also in the ‘Hollywood District’ of Woodinville and Mike Januik himself was waiting to greet us when we arrived. I was honored to meet one of the world’s ten “Masters of Merlot” by Wine Enthusiast magazine, and he escorted us immediately to where he’s most comfortable, the winery. Mike does not rest on his laurels, although he could if he wanted to. 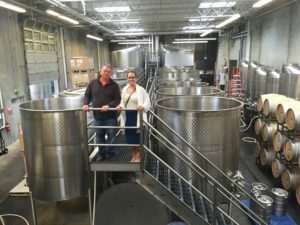 His experience in Columbia Valley and the Washington industry dates back to 1984, shortly after earning his master’s degree in Enology and Viticulture from the University of California, Davis. He spent ten years as head winemaker at Chateau Ste. Michelle before leaving to start Januik Winery in 1999. He built Novelty Hill Januik in 2007, a tasting room and state-of-the-art production facility in Woodinville. Mike manages and makes the wine for both Novelty Hill Winery and Januik Winery, which share the production facility. The natural, yet sleek building is a wonder… it won numerous awards for design, including the Pulitzer equivalent American Institute of Architects’ “Institute Honor Award”. After of tour of the winery, we saddled up to the stylish tasting bar and Mike opened several of his bottles. At Chateau St. Michelle he obtained a vast background of working with so many varietals. His abilities and style now at Januik is towards blends, where he can coerce each varietal to express their strong suit in a blend. All fruit comes from the dry east, from outstanding vineyards like Champoux and Stillwater Creek. Although the west remains dry and cooler, Mike did speak honestly about each increasingly warmer vintage. He’s seeing earlier than normal bud break. 2013 was a big deal as the warmest vintage of the decade, then was quickly eclipsed by 2014 and 2015 which turned out to be even warmer. Perhaps Mike’s greatest work and legacy is his son, Andrew. 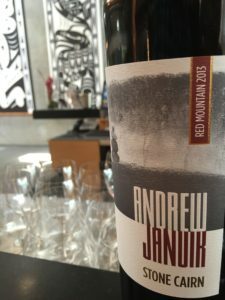 Andrew Januik has become a solid winemaker in his own right. He first became involved in his father’s operation at the age of 13, helping out during school vacations. Since first working a harvest in 2004, he has taken on more and more. Now Andrew will spend several days in Eastern Washington every week with his father in the vineyards, incessantly tasting grapes for ripeness and phenolic qualities. A great example of Andrew’s talents, both inherited and hard earned, is the Andrew Januik 2013 Stone Cairn. As Mike poured his son’s wine he shared that this bottle comes from some of the best vineyards in Red Mountain AVA, Shaw, Obelisco, and Ciel du Cheval Vineyards. It’s a blend of 92% Cabernet Sauvignon; 6% Merlot; 2% Cabernet Franc, with really thick tannins, complexity and suppleness. What a success, given that Andrew launched this as his first wine in 2011. The large state of Washington can be overwhelming, but Woodinville makes for a full and thorough experience of Washington wines. From its old history and prominence with Chateau Ste. 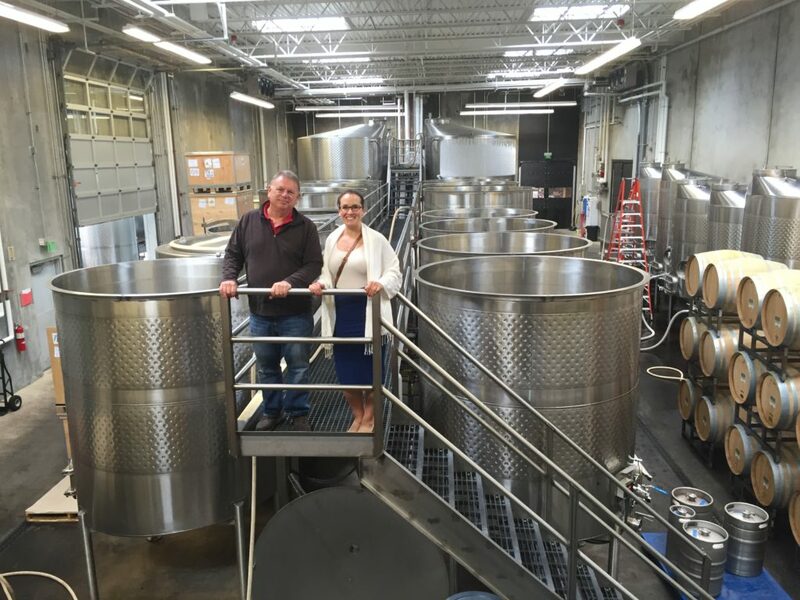 Michelle, to Mike Januik and other veteran superstars, to it’s future like Andrew Januik, Woodinville reveals the story of Washington wines, one tasting room at a time! A big thank you to Chateau Ste. Michelle, Novelty Hill Januik and Mike Januik. 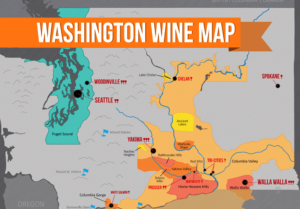 Find many Washington State wines at Vintology!